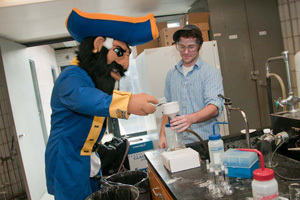 The Chemistry Club, the Undergraduate American Chemical Society affiliate, promotes an active social and professional involvement for the chemistry major. Trips to industrial laboratories, (such as Pfizer Pharmaceutical); government laboratories, (Rhode Island Department of Health) and attendance at monthly meetings of the Northeastern Section of the American Chemical Society routinely form a major part of the club's activities. The Club also sponsors faculty-student events like bowling, and co-sponsors the Department Awards Presentations.